Make someone laugh with this humorous card from the Paperlink A Colourful Mind series. 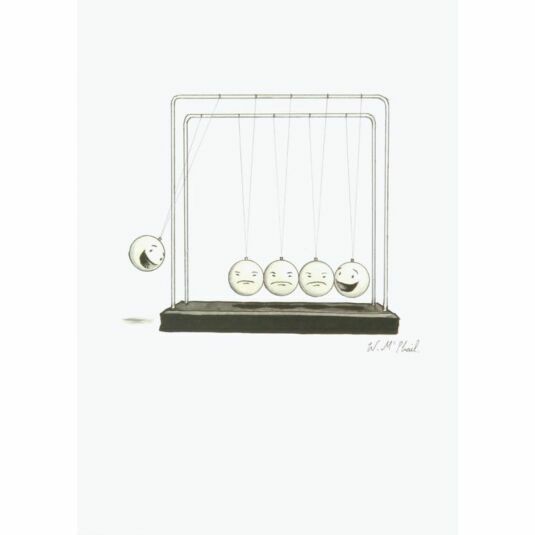 The cartoon image depicts a Newton’s Cradle – the desktop toy favoured by executives, consisting of a row of suspended metal balls. The balls at either end are grinning widely, while one of them is about to hit the three middle balls, all of which have miserable expressions. There is no caption, and inside the card is left blank for your personal message. The card measures 12.8cm x 17.8cm and comes with a brown envelope.